June 3rd – 5:20P & 6:00P. June 10th – 5:20P & 6:00P. June 24th – 5:20P & 6:00P. July 8th – 5:20P & 6:00P. June 3rd – 4:00P (Sold Out). June 3rd – 4:40P, 6:40P, 7:20P. June 10th – 4:00P, 4:40P, 6:40P, 7:20P. June 24th – 4:00P, 4:40P, 6:40P, 7:20P. July 8th – 4:00P, 4:40P, 6:40P, 7:20P. Goats to Go on Facebook, Like/Follow us at Goats to Go. 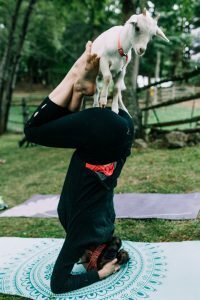 Pictures and Videos of our Goat Yoga and Snuggle Classes: Picture Album 1. Picture Album 2. YouTube Video. Q. Where are you located and how do I get there? A. Our private farm is located in Georgetown, MA (or at Black Prong Equestrian Center in Bronson, FL). In Mass, we are 30 mins from Portsmouth, NH, 40 mins from Boston, and 1 ½ hrs from Portland, ME. For your GPS use 201 Pond St Georgetown, MA 01833 or GPS coordinates: 42.743732, ‐70.987688. From the Center of Georgetown head north on North St and take the first left onto Pond St and travel 1.2 miles and take a right onto our long driveway with a blue “Great Rock Farm” sign. Arrive at least 10 mins prior to your session (and no earlier than 30 mins) to avoid confusion with other class sessions. In Florida we are 45 minutes from Ocala and Gainesville and 2 hrs from Jacksonville, Daytona Beach, Orlando, and Tampa. GPS Coordinates: 29.323171,-82.600928. Q. What should you bring? A. Bring a mat (or towel is recommended for easy cleaning), water bottle, a camera, and an open-mind with a great attitude. Everyone will get time to snuggle and pet the goats during your session. Your registration includes goat treats & hand sanitizer. Q. Interactions with the goats? What if the goat pees, poops, nibbles, jumps on me? A. Just like a bird pooping on your car, it’s your lucky day I guess! We will do our best to help you shake the pebble poops off your mat and keep the area you are in clean, but they are farm animals and nature calls sometimes. While our goat kids are very social and friendly, each animal is different in how it interacts with you: some will come right up to you and others may be a little shy. Patience, moving slowly, and a feeding a goat treat are the best ways for you to pet, hold, and snuggle with our baby goats. None of our goats are trained to do acts or tricks and they are merely farm animals we want to offer you to partake in some therapeutic relief and bring a smile to your face. Q. Tell me about the sessions and the goats? A. Class sizes range average around 30 participants. 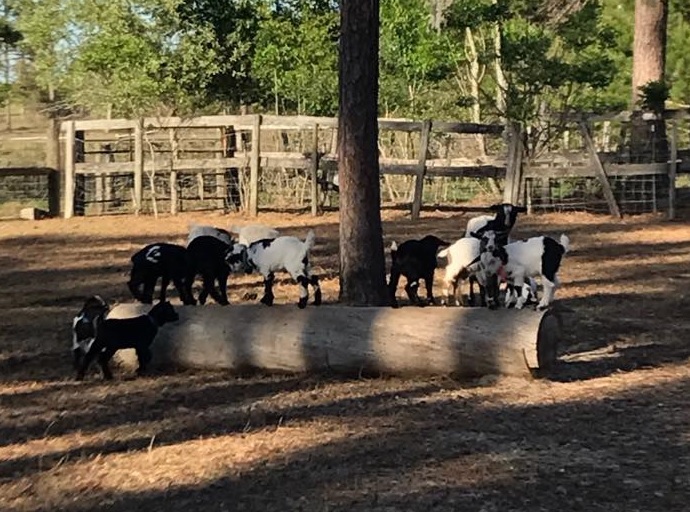 We have over 30 baby goat kids and use between 10 to 15 goat kids for a class. They are Myotonic “fainting” goats, Nigerian Dwarfs, or a mix breed. Q. Is your farm open to the public, can we stop over to pet animals? A. No, unfortunately we are a private working farm in Georgetown, MA and do not have staff or a setup allowing drop-ins or other visitors that are not prearranged. At Black Prong, this is a active facility with many events open to the public.